All for one, one for all! Merry Christmas d'Artagnan? I know this isn't our very first look as we did feature a photo of Mads Mikkelsen as Rochefort in August, but let's get right into it. The first official photo from Paul W.S. Anderson's The Three Musketeers 3D has been unveiled (via SlashFilm). Seen below are the actual three musketeers, Matthew Macfadyen (Athos), Ray Stevenson (Porthos) and Luke Evans (Aramis), plus D'Artagnan, the youngest one seen wearing the white tunic, as played by Logan Lerman. It's a good photo featuring all of the musketeers and a fun first look to see this holiday weekend, so check it out below. 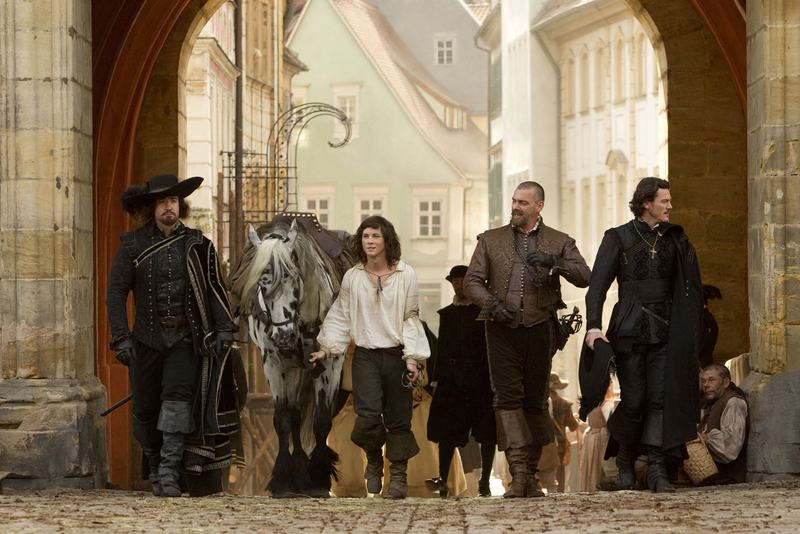 The Three Musketeers, which was actually shot entirely in 3D, is being directed by Paul W.S. Anderson (of Resident Evil, Death Race, Event Horizon) with a script adapted from Alexandre Dumas' novel by Andrew Davies and Alex Litvak (Predators). Summit Entertainment has this set for release on October 14th, 2011 next year. 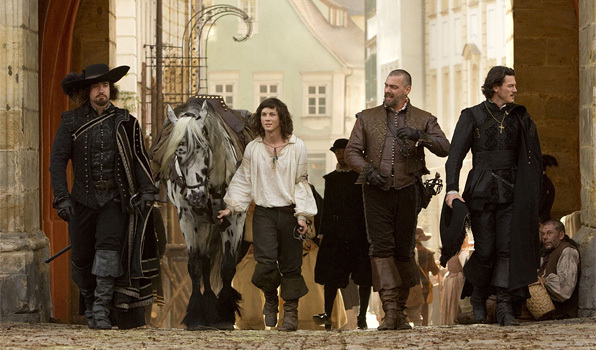 In addition to Mikkelsen and Lerman, The Three Musketeers stars Orlando Bloom as the Duke of Buckingham, Christoph Waltz as Cardinal Richelieu; Matthew MacFadyen, Ray Stevenson and Luke Evans as Athos, Porthos and Aramis, respectively; and also Milla Jovovich as M'lady De Winter. Your thoughts? xerxex - BIG agree..............in this version, is D'Artagnan 11 years old? btw - MERRY CHRISTMAS, everyone! So it is three muskateers and their trusty squire? what xerx said.... and Happy Holidays guys! Mads Mikkelsen as "Rochefort" & Christoph Waltz as "Rchelieu" I'm sold! Happy Festivus!!!! Let the grievances & feats of strength begin!!! @beavis: D'Artagnan is 18 or something in the book ... like Logan Lerman ... but w're so used to have 30 years old play teens that when a real one comes along he looks like a child (but his hair looks ridiculous ) But it sure as hell doesn't look like Paris behind them but like some central european city!! It's spelled Macfadyen, no capital F!!!!!! Logan Lerman should cut off that fake long hair and go back to being the cute Jewish boy he was. Looks great. We will be there! bob - good point and thanks for the info...........i still think lerman looks like a child with long hair, but hopefully he'll pull off the role.